This cute little octagon table is one-third of the trio of tables we found on a garage sale-ing trips a few years ago. The first table I painted with CeCe Caldwell’s Memphis Blue and a chalkboard top. It sold on it’s first trip to Treasure Island Flea. This was an easy project. 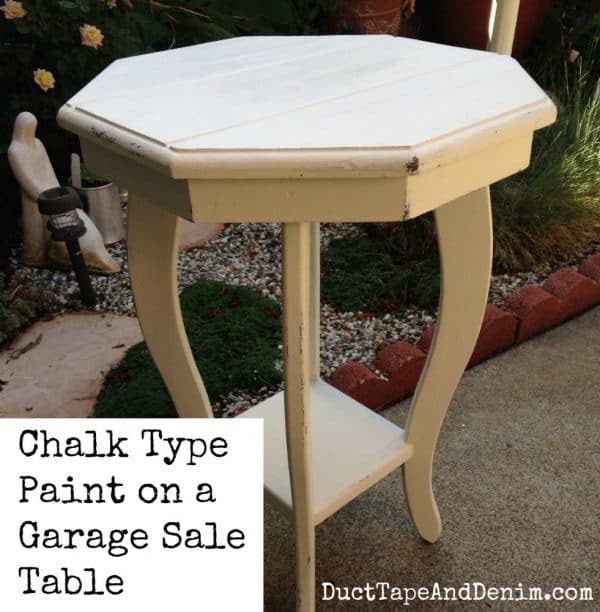 I just wiped the table down to get rid of dust and cobwebs, covered it with one coat of CeCe Caldwell’s Vintage White natural chalk and clay paint, let it dry, wet distressed the edges a little, then waxed it. On another note… I’ve told you before that I’m not a painting expert. I’m just sharing with you as I learn. I finally got the hang of waxing and have now realized that not all furniture should be waxed. UPDATE: Our shop no longer sells Cece Caldwell paints. These are the paints I’ve been using recently and I love them! 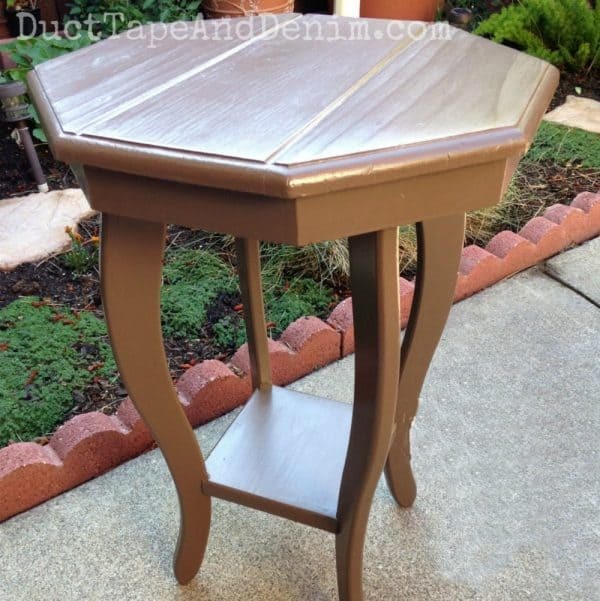 Two of my previous projects, both small end tables, were painted Seattle gray and waxed. We both eat in our living rooms a little more than I’d like to admit. We’re not slobs but I noticed last week that some crumbs had fallen on our table and not been wiped off. (I won’t mention who had been eating chocolate chip cookies in his favorite chair while watching Star Trek.) The crumbs left little greasy spots on the wax finish. Jordy said the same thing happened to her table. I’m hoping to repaint the top of my table soon and finish it with something that can handle a little more abuse. CeCe Caldwell has a product called Endurance Finish for this purpose but I haven’t tried it yet. As a matter of fact, this white table was the only piece of furniture that didn’t sell that day at Treasure Island. So I brought it home… where it found it’s place in my bedroom between two chairs that I found last week. And the wax top shouldn’t be a problem here since I don’t eat in my bedroom. (At least not very often.) ANOTHER UPDATE: This photo was taken a few years ago when I first wrote this post… The room looks MUCH different now. No carpet! Hopefully I’ll have a new blog post up soon. And you can add these chairs to the list of things I found while on my daily walk. It was late on a Saturday afternoon a few weeks ago when I finally got my walk in. Sometimes it pays to go late to garage sales! I had specifically been looking for a small, simple chair to go in my bedroom. I found these for $5 each so of course I had to buy both of them. Exactly the mid-century Danish lines I was looking for. And they came with a great story… the seller told me her friend’s dad brought them back from Europe on a B-52. Don’t know if that’s really true but it’s a fun story to tell. She had reupholstered them so the fabric is new but I don’t like it. After the wedding I’ll probably work on these. Originally published July 7, 2014. We share with these blog parties. Featured on Swing into Spring. Thanks. This sounds like just what I was looking for. 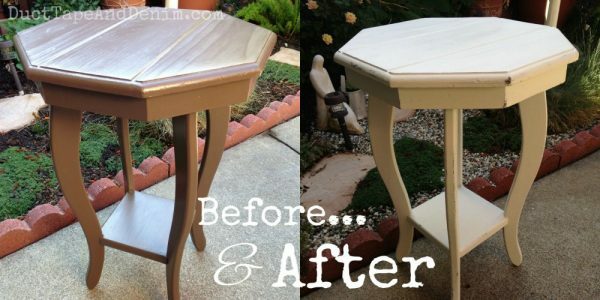 I never get tired of seeing makeovers to show the power of paint. The table is so fresh looking and is right at home with the new chairs. 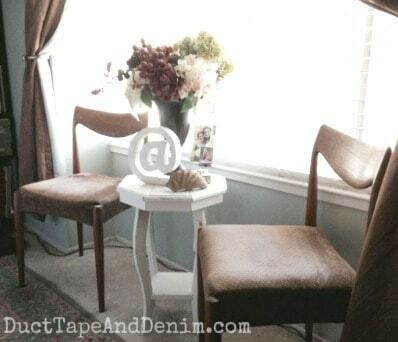 I saw your post on Snickerdoodle link party and I love the way you updated that little table! I love that it is octagon shaped! We had some similar ones when I was a kid. Great makeover. Thank you for sharing on Merry Monday! Hope to see ya next week! I love the makeover. It looks great between the chair and with the accessories. Thanks for sharing on Sunday’s Best. Love the transformation! Looks absolutely wonderful. Thanks for sharing on To Grandma’s House We Go! Love the new color! Thrift shopping is so much fun!! Thanks for sharing with SYC.